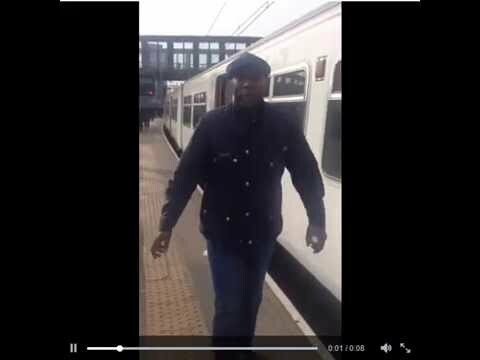 A GROUP of West Ham supporters have responded to a video showing racist Chelsea fans blocking a black man from getting on a train by releasing a parody clip showing them doing the opposite. The spoof video, filmed ahead of the West Ham - Tottenham Hotspur derby yesterday (Feb 22), shows the Hammers standing up to racism and showing how they would have handled the situation. In the clip a black man is seen walking up to a train door saying: "This is how we do it at West Ham" before asking a white man: "Can I get on the train, sir?" He receives a warm welcome with two men saying: "This is West Ham my friend, on you come." The video was posted on Twitter by Arron Thomas today with the caption 'claret and blue is all that matters' and has since received more than 2,000 retweets. Thousands have shared the video and comedian Russell Brand tweeted: "Comedy as a weapon against hate. Very funny." The video was in response to footage showing Chelsea fans repeatedly blocking a black man from getting on a train in Paris amid chants of 'we're racist, we're racist and that's the way we like it' prompted a public outcry. The victim of the racist incident, Souleymane S, made an official police complaint and said he would like those responsible "found, punished and locked up". In the footage the Parisian can be seen twice trying to enter the tightly packed carriage, but both times being shoved back out through the train door.